We were going through emails and realized what a treasure trove of creativity and comments we have to share. It's such a thrill to watch something take form, "one stroke at a time." It's even more thrilling when you realize that many of these endeavors are done by people who didn't think they would do anything like this. Here's to: Putting pen to paper and creating that next stroke! 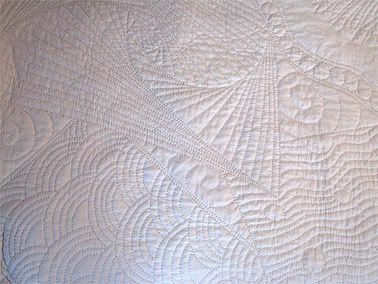 I have sent you a few images of a quilt that I just finished a few weeks ago. 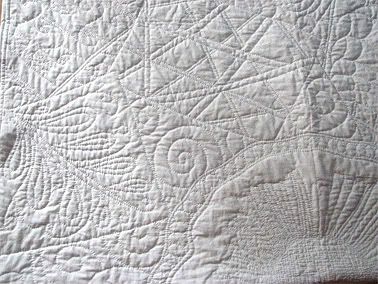 I have been quilting for over 30 years and tangling for about 1 and a half, I learned Zentangle from Joan Payton while she was visiting Nova Scotia Canada. 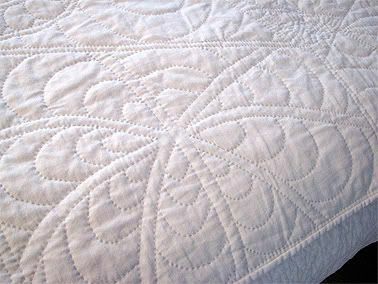 The idea of quilting and tangling together came to me one evening, and by the next evening I was nervously tangling directly onto the white fabric with very light pencil marks. I was afraid to make a mistake that couldn't be corrected, but in the spirit of Zentangle, I relaxed and the designs turned out beautifully. I drew 12 squares total, three in each quarter of the quilt, they include Rick's paradox, hollibaugh, mooka, betweed, and others that I can't name but are clearly visible in the images. In the center of the quilt I did a large freehand flower and a string of pearls surrounding it. I stitched the main designs in a light grey thread and the swirls in the background or negative spaces are done with a white thread. I enjoyed combining two of my skills to finished this quilt that fits on the top of a queen sized bed. I hope you enjoy looking at these images, but truly the joy was mine in the doing. Thank you for making this wonderful skill available to so many people and know that I, for one practice this art everyday. May I hug you??? You have put together a package [Apprentice Classroom Pack] for the children of today to find out that it is still OK to have and find their imagination. It is good that at least some small portion will be allowed to think outside of the box. Invention and discovery do not happen without imagination. Children do not know how to "play" unless it is with a technology driven "toy"- this will allow them to explore within, and find out that pencil and paper can be their friend, and even an outlet for fun and fortune. I am a (stubbornly) retired teacher. I am currently taking the class myself on Sunday afternoons, and have loved every moment of it. The hours slip by, and I leave totally relaxed, no worries, and no stress. 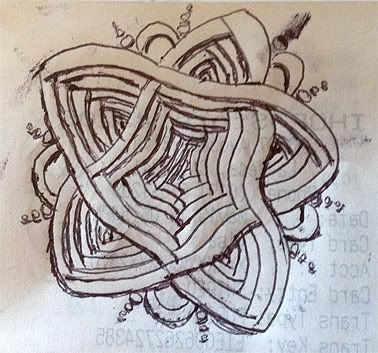 Who knew that a simple little tile, a small pencil, and soft music would have such a transfiguring effect? Thank you for remembering the children...our future. Thank you for having the dream to make things accessible, while still beautiful. Thank you for being dreamers. I had to drop you a line to say thank you. 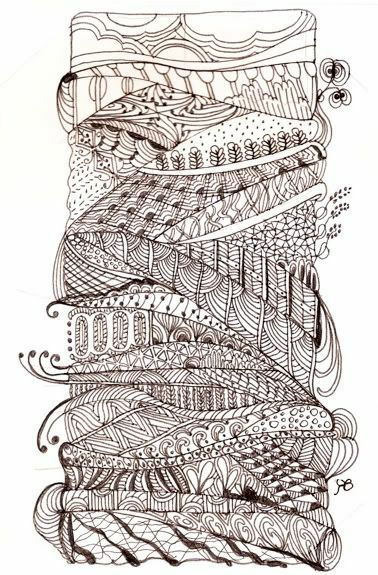 I came across Zentangle while surfing the web and have become an addict in just a few days.....I can't stop! :) I'm trying to learn the different tangles out there, but am also just going with the flow of my own designs. I can't believe how soothing the creation process can be. The other day my husband came into the room where I was working and the TV was on. He said..."you've been watching that infommercial for an hour, how can you stand it?". My response was, "I didn't even know the TV was on!" 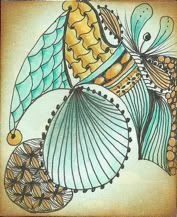 I just wanted to share with you my first few Zentangles......hope you don't mind. Again, thank you, thank you, thank you for the peace this brings to my soul. I am so happy with the kit I received yesterday. I could tell that it was lovingly and mindfully designed. I'm having fun with the tangles - at the same time that I am relaxing. A much needed respite from stress. 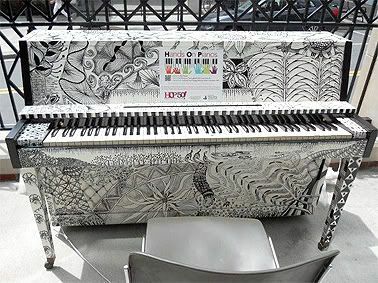 As I was looking through posted pictures on Facebook, I came across this fabulous piano art! I have attached the photo. On my flight to & from Savannah, I got to 'tangle'. Several passengers would look over my shoulder (I was in the row just ahead to the emergency exits) & ask what it was I was 'doodling'? I showed them the kit & the pattern book & several tangles I had already done. I told them about your website & how much fun I have had 'relaxing'. I hope that they do visit your site! 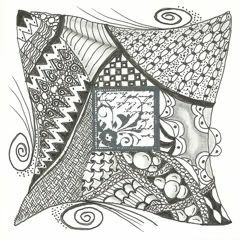 I'm from Belgium and I found your Zentangle website and subscribed to your newsletter a few months ago. 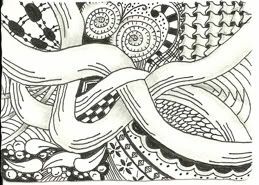 From the first time I looked too the Zentangles, it was love at first sight :-). So I took an old booklet and started to draw some things to clear my mind from all the clutter. THANKS FOR SHARING THIS WITH THE WORLD !!!! We have so many more, but we'll save them for another newsletter. Thank you all so very much for sharing your creativity . . . with others, with us, and with yourselves!